Everyone on Jeju has heard about it, but you’d be hard pressed to find many who have been there. Hundreds of thou-sands of tourists go to Udo, and many have visited Marado. However, before Olle Course 10-1 was opened on March 28, the islet of Gapado went largely unnoticed. Until now. It can be tough to wake up early enough to catch the first ferry to Gapado but when we arrived at the port of Moseulpo, the harbor was packed. You could feel a buzz in the air for the trail’s opening day. The island was certainly being noticed now. Ten short minutes after it departed, hundreds of excited hikers poured from the ferry onto Gapado for the ribbon-cutting ceremony. Looking back at Jeju, the view was spectacular in the morning light, making the early start well worth it. With most olle courses averaging 15 to 20 kilometers, Gapado’s 5 km trail is by far the shortest. Suh said not to worry about this. From the harbor at the northern tip of the island, we started walking along the western coast. The people on Gapado are mostly fishermen. It wasn’t long before you could see the haenyeo diving women in the sea collecting abalone, urchins and other seafood. 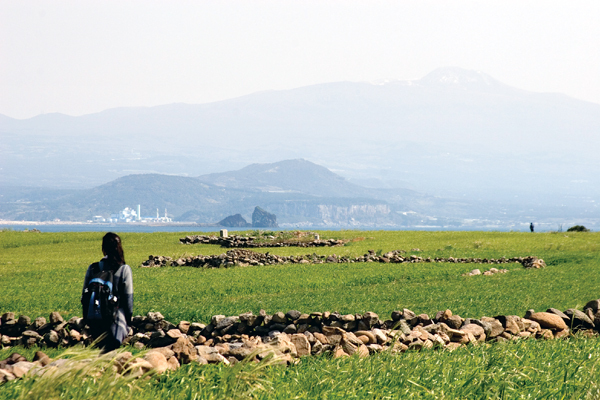 Just as Marado, Korea’s southernmost island, came into view, the trail cut back into the emerald green barley fields. As we headed back towards town, again looking toward Jeju, we came across a stroller. It was not for a baby though but used as a walker by an elderly woman, a sign of Gapado’s aging population. The isolated island of Gapado is 5.5 km from the Jeju coast and a 10-minute ferry ride away. With a population of 250 and only a single elementary school catering to 10 students, the people of Gapado are looking forward to the tourism that the new olle trail is sure to bring. “We have felt left alone for years and years,” said Kim Dong Ok, Gapado’s community leader. “We have seen people visiting Marado, an islet in southern-most South Korea and Udo , but not visiting Gapado... It will not only bring economic benefit, but also we will no longer feel left alone or lonely. We are really grateful to Suh Myung Sook, the olle founder, who put in a lot of effort to open the course here on Gapado. Gapado can be reached from the Moseulpo harbor. Ferries run regularly, weather permitting, at a cost of 8,000 or 10,000 won for an adult round trip, depending on the boat size, with half-price fares for children.